Following up with the "How long" question, I'm curious as to how strict people are? So if you've run the stats on all these answers, maybe you could put your conclusions in the comment here? Oscillating between #3 and #7 for about two years now. Evil black pudding. When I lived in Sweden I thought it was kind of paleo until I learned enough Swedish to read the ingredients: mjöl, söcker...blargh. Yeah, this question absolutely is NOT in the interest of categories and purity. Actually I think of it as an antidote to all the admittedly really good, yet categorical answers by seeing how people are actually choosing to live. I guess maybe it's support for the not so "pure" by seeing they are not alone and 50% Paleo is still vastly better than none at all. My husband and I (ages 37 and 31 respectively) have been paleo for about a year now. Ask me who has more trouble keeping her weight in check, though. It's just not fair! I did cheat (or "experiment," as I like to say) at your #4 level for about a week after about 8 months, but it was a one-time thing (quite a disaster, actually). Also, I think 6 and 7 are really the same thing; I see no reason to exclude dairy from Paleo. I'd say 4 or 5, definitely cheat less and less as time has gone on and cheats are less serious. When I started the cheats were BAD...candy, ice cream, crap...now they tend to be things like hummus or grits. I'm a 6. I've been strictly Primal Blueprint (lowest carbs) for about 6 weeks. Before that, I was at # 3 for about 6 months. Somewhere between 4 and 5, about one year. I certainly don't "cheat" at every meal but I do have small amounts of grain almost every day, and every once in a while I will completely drop my guard and eat a bunch of cookies or something. I don't beat myself up about this, but I am working on cutting it down. After an undetermined amount of time has passed (figured my body will let me know) I will probably loosen up the rules a little and start testing things like dairy in small doses. I don't like to obsess over categories and paleo "purity," but it would be somewhat interesting to see the answers, so I'll start. I am probably closest to #4, about 5 months. Strict 6, if by Lacto-Paleo you mean that I also include dairy in my diet (milk excepted). I'd say that I'm a 6.5, because I'm basically a carnivore (carbohydrate @ <25g/day), but I do add salt to my food on a regular basis. I also do my best to eat the "right" meats and cheese, and when I do eat regular cuts of meat I'll cook it in grass-fed beef tallow to improve my 3-6 ratio. I plan to reincorporate more fruit and vege's into my diet as time goes on and as my waist line continues to shrink. I've been "paleo" since December of 09'. As I mentioned elsewhere, a beer at a friends party, a free cookie, offered slice of homemade cake, etc. - those things I don't really resist. I gotta add I intermittent fast at least once per week, and was on the Stronglifts 5x5 program for the last 2 months. I think that adherence to exercise is just as important as the food we eat (80/20 rule barring). Strict 7 (+ no nightshades + no nuts). >1 year. I have to be super 100% strict Paleo because of my health problems (post-infectious IBS, SIBO, PCOS, prone to weight gain, insulin resistance, etc). I can't even have butter, dark chocolate, nuts and nightshades. Eating too much of even non-nightshades low-FODMAP vegetables, eating chocolate or even butter = abdominal pain, brain fog, severe bloating, etc. I have been eating strict Paleo for over a year now, but have only had to eliminate nightshades, chocolate and butter recently due to reappearance of some of my symptoms. I hope that as time goes by, my gut heals and seals itself, because I would not see any problems in including butter, a bit of cheese, chocolate, some nuts and occasional coconut flour-based treats once in a while! I believe that not everybody has to be that strict, it really depends on your health and goals! 100% Paleo 1.0 (biased towards the writings of Audette, less on Cordain). I remember two specific cheats in a year's time, once with ice cream and once in an attempt to re-introduce dairy. 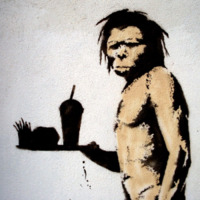 80% Paleo/90% Primal ? - Modified Paleo with 1.0 views, more dairy and less nuts than my first time around (in the form of hard cheese and heavy cream) and some long-term (2-3 month) experiments with safe starches. Also, I tend to cheat a little more often - with alcohol and certain gluten free foods (comprised mostly of foods that start with "tac" and end with "os"). I would say that I've had about 1 dozen "free weekends" where I ate decidedly un-paleo for Fridays and Saturdays since November 2010. Strict 6 for 2 years. I eat homemade yogurt only because it helps my health. Hard aged cheeses because them seem ok. Other than that no milk, no cream cheese etc. Strict 5.5, months 2 and rising. I have probably been about 3.5 for the past month and heading to 4 then 5 for sure. My worst cheats are the odd beer here in hot Mexican weather( it goes down SO good when you have been packing bricks in the sun!) and U-brew red wine for happy hour and with dinner. i'm at about a 4.5,3 years in. happy at this level of immersion for maintenance and health with sanity relatively intact. Tried whole 30 twice and while the results were good i find it causes me to worry too much about food an sets me up to binge eat. maybe 4.2 for about 3 years. Aiming for 6 long term but it's hard to kick sweeteners, the occasional legume (peanuts, kidney beans) when there's no food in our share-house and beers when i'm out an drop my guard a bit. 4 works for maintenance but in my experiments with strict paleo e.g. whole 30 i usually start to drop weight again. I am a strict 6, for 8 months. My husband, well that is another story, he is a 3. He cannot seem to give up the hamburger bun. He gave up everything else though. lacto paleo with high ffatay dairy(28% cheeses, butter, whole(3. 8%) or higher milk). cheat weekly with 1 carbonated drink(250cc bottle or a 330cc can). my carb intake consists of potatoes, sweet potatoes and fruit. I do however, drink about three pints of beer every other week or so with my friends. been paleo for about 4 months now. 3 trying to get back on the wagon. I dunno, I guess 5ish. I never had much of a sweet tooth so avoiding sweet stuff isn't much of a challenge. Nearly everything I eat is homemade by me. I don't worry about incidental amounts of sugar or cornstarch (like in a homemade stir-fry sauce), but I avoid nearly all processed foods, all "sweets" (other than 85% chocolate) and baked goods, and use good fats almost exclusively. I eat very little dairy other than butter and occasional hard cheese. I eat potatoes or rice occasionally, maybe 3 times a month; corn less often, and gluten grains and unfermented soy not at all. Most -- 80% or so -- of my meat comes from a local farm that raises it the right way. I started almost a year ago and I've done a lot of experimenting along the way. Hard to say when I settled on the above... probably 3 months ago, give or take. Going to go for a strict 10 for a month to "wash out" .... have to start "NOW" since I just ate some cookies after lunch. Only been Paleo for 5 weeks, stayed a strict 7 the entire time. 100% PALEO, 90% of the time. Between a 5 and 6 - some weeks 5, some weeks 6. Coming up to 6 months. I'm just getting started both with the diet and here on Paleohacks. Months: .5 (two weeks today, actually) Strict: 4 or 5, depending on classification of drinking. I'm a home brewer and have suspended the hobby for the moment. I've done a few GF beers, but I'm mostly sticking to clear spirits (I love my Martinis!) and wine for the relaxing drink or three after work. I did a full 30 days of strict paleo -- no grains, sugar, dairy, nothing. The end of that fell right around the start of my crew season, and I added dairy in (for the easy calories and convenience) without problems. I follow the model outlined in Loren Cordain's Paleo for Athletes, and my cheats all fall in the "post-training" window where I have a bit more leeway in what I eat; still, these are small (a scoop of ice cream or a cookie) and infrequent. I was following a paleo-ish diet before I switched, minimizing carbs but not excluding grains; since I've switched I find myself aiming for higher carb and moderate protein and fat to keep up with my training. I love eating paleo and the lifestyle of it, but living in a frat house I tend to lack willpower to eat paleo all the time..but it's usually beer or cookies that gets me. But I'm fine with that - until I'm able to completely sustain myself on my own and actually have uber amounts of money, I'm going to remain at a 4. Started off as a strict Paleo for about 5-6 months, then started including starches and have felt much better ever since. Date night is sushi, chocolate bar and movie. Probably 5. A year and a half. Strict 5.5 since January 2012 (pastured butter is my only dairy, no gluten, low carb), before that I was a 6 for 2+ years - with very very little cheats at all ever. Pretty strict 5 or 6 days a week, my wife can't (won't) follow the diet so one day a week eating what she wants makes things easier. Strict 5 . Months 18. I'll say a 5, 20 months in. Considering cutting out dairy/nightshades (allergy issues), but haven't yet made the leap. 5, but with as few cheats and as little dairy as possible, for 3 months now. 4 or 5 ish,6 months.Fell off the wagon hard the last two weeks(vacation, lot of bar trips,easter candy,too many Mexican restaurants with big chip baskets and slow service).Slowly getting back to normal after realizing how crappy I feel. From 0 to almost 6 (cheats about 2 times a month), 9 months. Cururently, almost 6; 2 months. I'm pretty much lacto-paleo at about a 5. Beer once or twice a week and maybe something made of corn or rice. 4.5 for years would be my closest placement based on your chart. I do regularly use a sprouted grain english muffin (3 time a week) for burgers, but that's about as WAPF as I go. The cheat meals consisting of the Swedish version of black pudding (= 52g carbs, some wheat and rye flour) w/ lingonberries & bacon once a month or so. Occasionally I go crazy on Turkish yoghurt (10%). 7- was doing some butter and yogurt, not a lot. now off it. cheat with a smoothie coffee and whip cream or dark chocolate once every 2 weeks. paleo 7 months.